Day Six - Buenba Camping Area is start of track in middle. Mt Pinnibar is track out to left top middle. Tom Groggin is top right end of track. Limestone Creek is bottom end of track. We get up at 7:30 am and it is already 22.6°C, meaning that the flies and March flies are already out. While it was cool during the night, it has warmed up quickly. 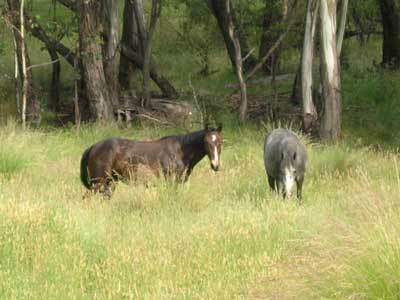 Kelly says that she could hear brumbies during the night. Before we leave, I check the tyre and the pressure has dropped to 20 psi so I top it up again to 45 psi. Today we are doing a ^ shaped journey. As we come out towards the road, we find three cars in the spot we looked at yesterday. We had heard them arrive on the radio last night. We continue north from Buenba Flat along Smiths Logging Road (it is also shown as Buenba Road). It is a bit rougher and our speed slows a lot. It is quite steep for the first few kilometres and we get to 1150 metres and then start following the ridge. The road varies a bit from what is shown on my topographical maps and we get to 1380 metres as we come to the turn off for Mount Gibbo. 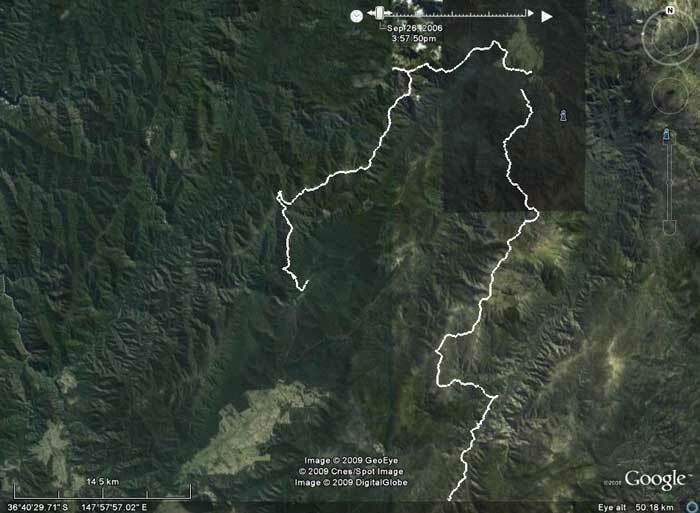 This track is on the right and shown as Mt Gibbo Track (also shown as Wild Boar Track in some places). The track from here is fairly steep as we climb towards Mount Gibbo which is 1750 metres. 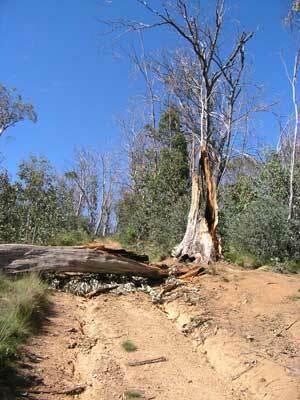 About 300 metres up the track we find a huge tree across the track. We knew this was here as the cars we saw this morning told us about it. While they got around it, we are going to have problems as from our direction of driving uphill, we have little room to maneouvre around the log without hitting the tree stump it fell from. I decide that I will need to cut a bit out to make it easier. I get the saw out and cut off some loose bits from the top of the log. I then cut from under it as the weight will cause it to jam on the saw if I cut too far from the top. When I swap to the uphill side, the saw gets jammed. Damn! I cannot get it out. I do not have any wedges so this is a problem. To cut the story short, I eventually get the saw out by pulling it apart (I was going to sacrifice the bar and chain if I had to), pulling the bar out and then, using a small axe as a wedge, opening the cut enough to pull the chain out. I decide here to buy a couple of wedges as well as a spare chain. We have been here 35 minutes. I am hot and sweaty after this, so a cool drink is needed as well as full air conditioning in the car. 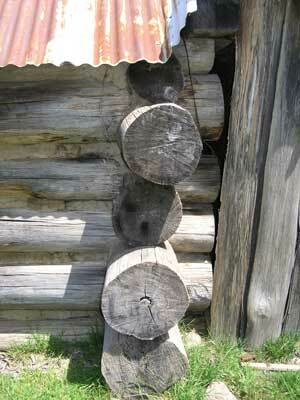 We get around the log, still with a little difficulty. It is a steep climb for the next 1.5 kilometres to the ridge and then another 5.4 kilometres to the summit. This has some great views. We leave at 10:30 am after a 15 minute stop. It is a bit too hot to have morning tea here so we decide to have a little later. From Mount Gibbo the track drops quickly for the next 700 metres and about two kilometres on we come to Mount Anderson. The track drops a little more and then follows the ridge at about 1350 metres. Continuing on, 5.6 kilometres later we come to Wheelers Creek Road (which is the same track in reality as just before you started the climb to Mt Gibbo). Around here we figure out that there is a large tag along group in the area as we can hear them on the UHF radio. We also encounter a few small groups and the last one confirms that there are about 10 cars stopped a bit further up the track having morning tea. We start a gradual climb to over 1500 metres and we come to the large group. It looks like they are all recently retired as all are about 60 plus and have brand new four wheel drives. A good way to learn if you do not want to join a club. About 12.4 kilometres from Mount Gibbo we come to the Mount Pinnibar Track. 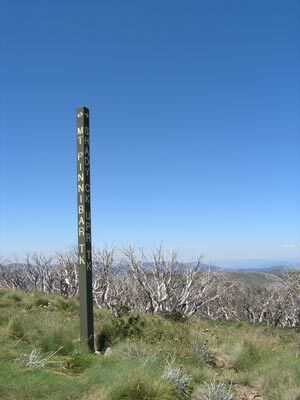 This is a short 1.2 kilometres to the summit of Mount Pinnibar. This is a relatively steep climb to the top. 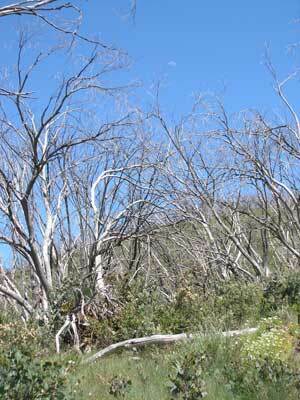 There are lots of dead trees, killed by the bushfires in January 2003. 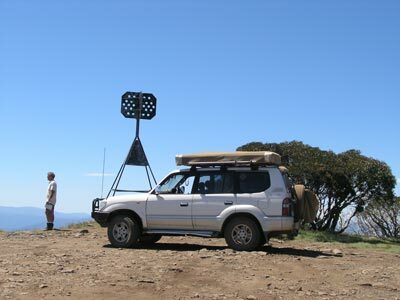 Mount Pinnibar is the highest point of the trip at 1772 metres. Again, there are excellent views from here to all points of the compass. There are two other tracks that come up the western side of the hill from the south and west. One of them is an alternative route to the way we have come. We leave at 11:35 am after a 10 minute stop. We backtrack down the road and continue past the intersection. It is all downhill from here to the Murray River. This track takes us to Tom Groggin. This is a locality on the Murray River, the border between NSW and Victoria. Tom Groggin is actually the name of the private property here and you have to pass through it to get back into the national park. The first 3.5 kilometres are quite steep and it is low range first and second most of the way. 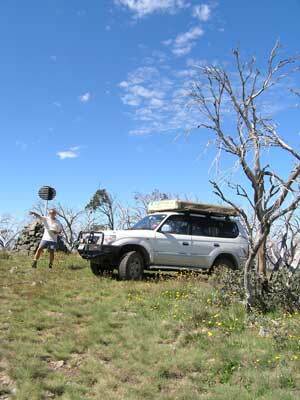 The track follows a series of ridges down to 860 metres till you take a right turn at an intersection. For the next period, it appears that the track does not follow what is shown on topographical maps and is different to that described in guide books. You enter the private property and cross paddocks. Most of the trip across the property is well sign-posted till you exit the property. Here there is no sign but we turn left figuring that the Murray River is the direction to head. Once out of the private property, we follow the boundary to the river where there is Dogman (or Dogmans) Hut Camping Area. There is a small hut here, very nice. 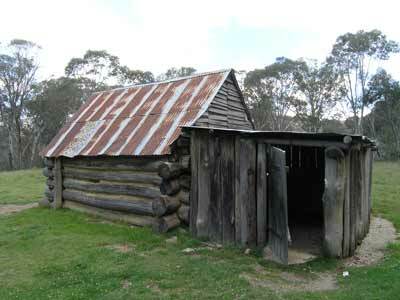 It is also known as Darkies Hut after the person it was built for. 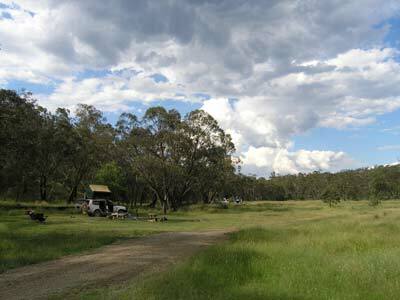 The camping area is relatively small but it has some large trees and is right on the Murray River. It also has a toilet, table and BBQ. We get here at 12:40 pm and it is over 39°C. We have lunch and then Kelly suggests a swim in the river. We change and walk the 25 metres to the banks of the river. 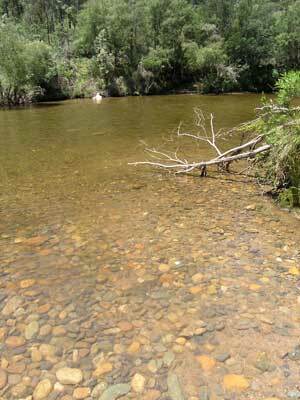 I step into the water and New South Wales (as the border is the southern bank of the river). It is cool but not too cold. I swim over to the bank on the NSW side and back again. It is only about 15 metres wide. This is nice. After the swim I check the tyre and it is down again to 25 psi. When checked earlier at Mt Gibbo it was still 45 psi and at Mt Pinnibar it was 40 psi. Not sure what is causing the leak, but it is erratic. After pumping the tyre back up, we leave at 1:30 pm. 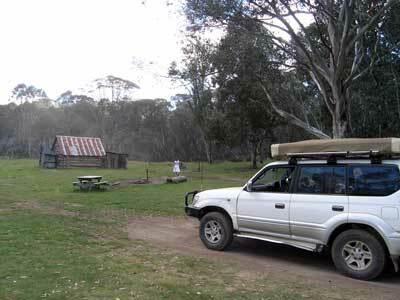 We stop at the Murray River crossing where you can drive across the river to NSW. We notice a lot of oil on the centre of the track and it leads up out of the river. Back on our way, we head south from here and leave the Murray River for a while. 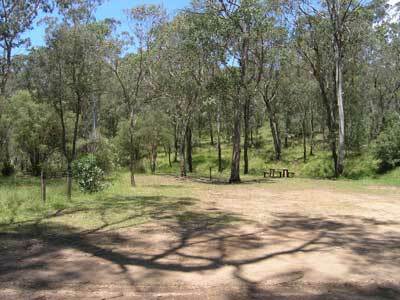 We are travelling on the Davies Plain Track and there are a few more places to stop, including SGC Camping Area (Seasonal Gate Closure as it is just near the gate) and Buckwong Creek. These are both nice, but the later one is better I reckon. It has a very nice camping area right next to the creek. We have noticed the oil leak a few times as we drive along and seeing two LandCruisers stopped in the camping area, I pull up to see if one of them is leaking oil without knowing it. As I walk over I see that the occupants are looking in a tree. They tell me that there is a snake eating a baby bird or eggs in the small tree. I have a look as well. Then I realise I know one of the males, but for the life of me I cannot think of who he is. Then he asks "Are you Michael McFadyen"? I reply "Yes". It turns out that they are former members of the Jeep Club of NSW who I have only met once or twice, Dave Rasdall and Bruce Cook. They are on a short trip like us with their partners. Amazing co-incidence, we would have never met them except for the oil leak (which was not from them as they are heading towards the river). We get back on our way after a 15 minute chat (during which they advised us about camping areas we were thinking of staying at tonight). 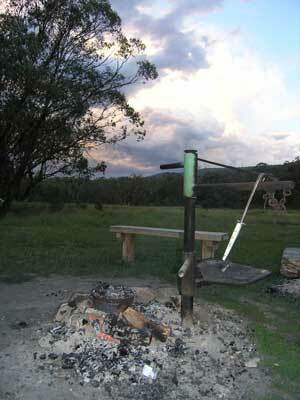 Just under an hour later we come to Davies Plain Hut which is about 13.7 kilometres from Buckwong Creek. 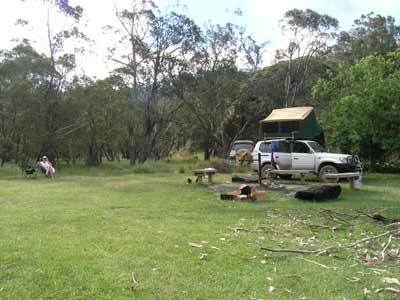 This has some niced grassed camping areas between a small creek the hut location as well as around the hut. There are toilets and BBQs. Very good spot. I check the tyre and it has dropped to about 40 psi. We continue on and at 3:20 pm we arrive at Charlies Creek. This is 13 kilometres from Davies Plain Hut. There used to be a hut here but it burnt down in the January 2003 bushfires. There are lots of nice camping areas with a toilet and BBQs. There is a camper trailer here but no car. I pump the tyre up as it is now only 30 psi. We continue on towards Limestone Creek. The track nearly all the way is around the 1500 metre mark. 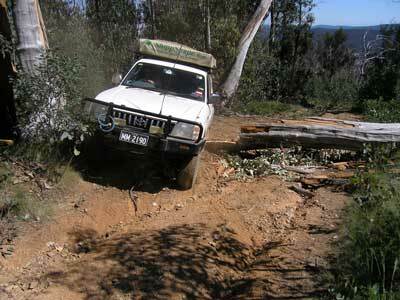 At the intersection with the Buckwong Creek Track and McCarthys Track, we turn left. 2.5 kilometres to this intersection (it is not an exact +) and then 8 kilometres to the Limestone Creek Track intersection. The track drops about 550 metres and we arrive at the intersection at 4:05 pm. I start down the track to McCarthys Camping Area (also referred to in some places as McHardies Hut or The Poplars) but it is rough going. We are already late so I turn back as we really want to get to Limestone Creek. Keith and Bruce have told us that McCarthys was burnt out last year and it is not a great spot. From here we go back and take a left onto Limestone Creek Track and head south again. 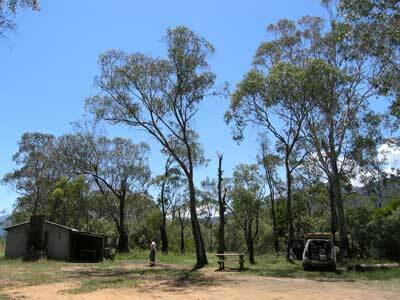 It is 12.4 kilometres to Limestone Creek Camping Area and we arrive there at about 4:50 pm. From Tom Groggin it is about 57 kilometres and it has taken us almost three and a half hours, with a couple of short stops. Tonight is New Year's Eve and Kelly and I have a celebration planned. This is our first NYE as a married couple and we are also celebrating successfully making it to the Victorian High Country after our failure three years ago. We have a few bottles of good Australian sparkling wine to wash down our roast beef dinner (followed by my special Apple Crusty Pudding). 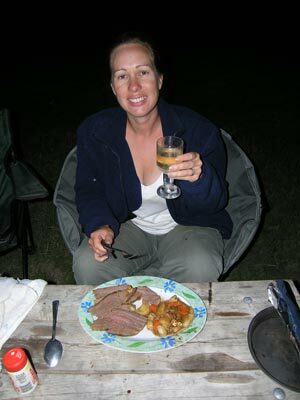 We find that the first campsite from the track has a BBQ and table and is right on the creek. 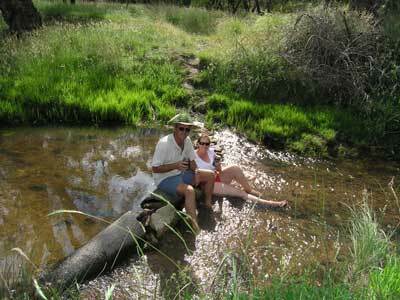 We set up camp in the shade and within a few minutes we are in the creek having a beer. It is not deep enough to swim in, but you can sit and splash water over yourself. The temperature is 32.5°C, pretty amazing considering we are at 950 metres. After the swim, we hear thunder and realise that it is coming from the black clouds to the north-west. They are not going to get us but an hour later there are more heading right towards us. We put up a tarp at the back of the car for protection but after another hour the storm has been turned back on itself by a change in wind. I see something further up the camping area and I think that that it is some kangaroos. I walk up past the only other tent here and I see that it is a couple of brumbies. I motion to Kelly to come and have a look. We can get to within 30 metres of them and they do not seem worried. There is a load of timber here already and I dump out all I have been carrying in the car. We have a good fire going from about 6 pm to get good coals and I put the roast on at 8 pm and within 45 minutes it is ready. What a great night! Who says you have to be on Sydney Harbour watching the fireworks to have a good night! We have our roast dinner washed down with sparkling wine, I cook up my pudding which we have at 11 pm and we celebrate midnight with a kiss or two. Between all this, we see 26 satellites (all but two of which are heading either north or south) and 12 shooting stars. We are both in bed very late, by about 1:45 am from memory.